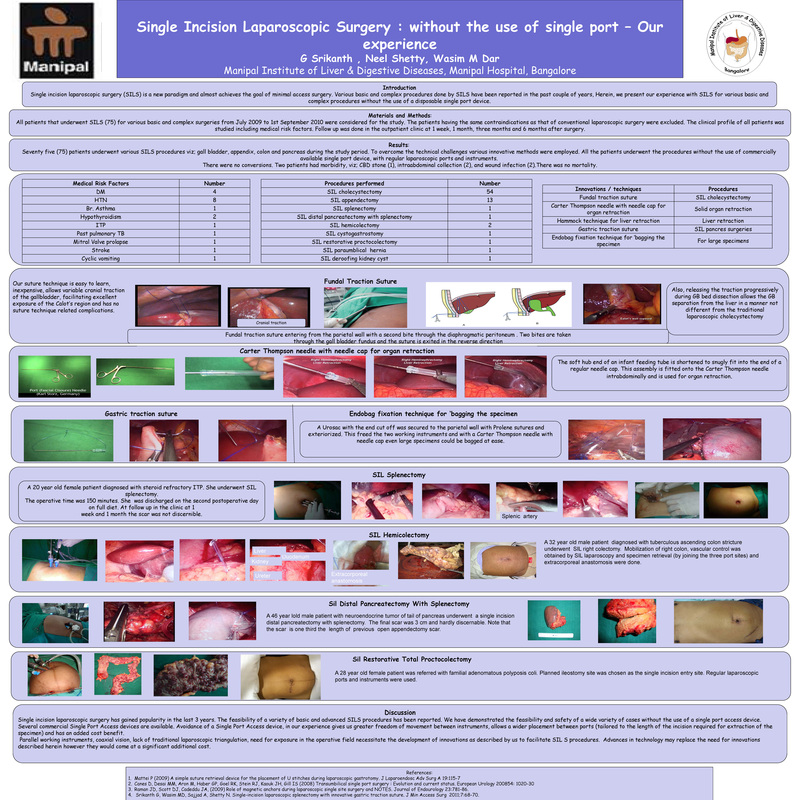 INTRODUCTION/OBJECTIVES: Single incision laparoscopic surgery (SILS) is a new paradigm in minimal access surgery which has gained wide popularity in the last two years. We present our experience with wide range of SILS procedures done without the use of single port device. AIMS & METHODS: To study the feasibility of SILS with basic and advanced abdominal surgical procedures. Clinical details, indication for surgery, operation records and postoperative course of patients undergoing SILS procedures from July 2009 to June 2010 were studied. Follow up was done in the out patient clinic at 1 week, 1 month and three months after surgery. RESULTS: Ninety nine patients underwent 101 SILS procedures during the study period. Procedures included cholecystectomy (64), Appendectomy (16), adrenalectomy(2), nephrectomy (11), two right hemicolectomies and one each of paraumbilical hernia repair, splenectomy, distal pancreatectomy with splenectomy, restorative proctocolectomy, cystogastrostomy and deroofing of renal cyst. All but seven procedures were performed without the use of commercially available single port device, with regular laparoscopic ports and instruments. However, innovative techniques were employed for achieving fundal traction of gall bladder in cholecystectomy, liver retraction during hemicolectomy and nephrectomy and splenic retraction during adrenalectomy. An additional port was used in two patients undergoing cholecystectomy during the initial part of our experience. There were no conversions. Seven patients had morbidity, viz; sub hepatic hematoma (1), intraabdominal collection (1), gastrointestinal bleed (1) , hematuria (1) and wound infection (3).There was no mortality. CONCLUSION: We have demonstrated the feasibility of SILS procedures without the use of single port device. Innovative techniques are required to perform SILS procedures, particularly advanced procedures. The advantage of procedures done without the use of a disposable single port device is low cost, use of regular instruments and an excellent cosmetic result.